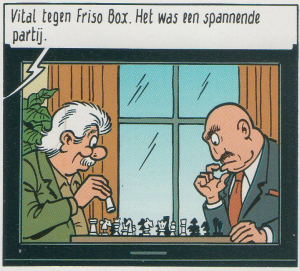 Every now and then, some mainstream comic of tv-series features chess in one of its episodes; by now you might already be aware of that. Once in a blue moon it happens twice in the same series. On such a rare occasion, one would perhaps be inclined to expect that one of the people involved has a thing for chess and that, consequently, the chess is quite good. Alas! Once more, you’d be mislead into overestimating the general public’s knowledge of chess. I already talked about volume 14 from the highly popular1 Kiekeboe series, today I’ll spotlight volume 89: De s van pion. 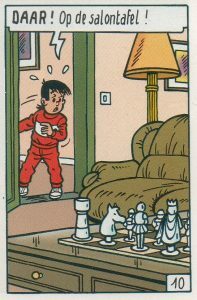 This time, chess even made it into the title, which translated more or less to s like in pawn. In Dutch this looks sort of like a pun if you squint at it sideways, as adding the s to pion gives spion, which means spy. The plot revolves around the disappearance of Vital, the main character’s uncle. He’s supposed to show up for a small family dinner, but he only sends a short telephone call talking about upcoming war and the rook of his chessboard. 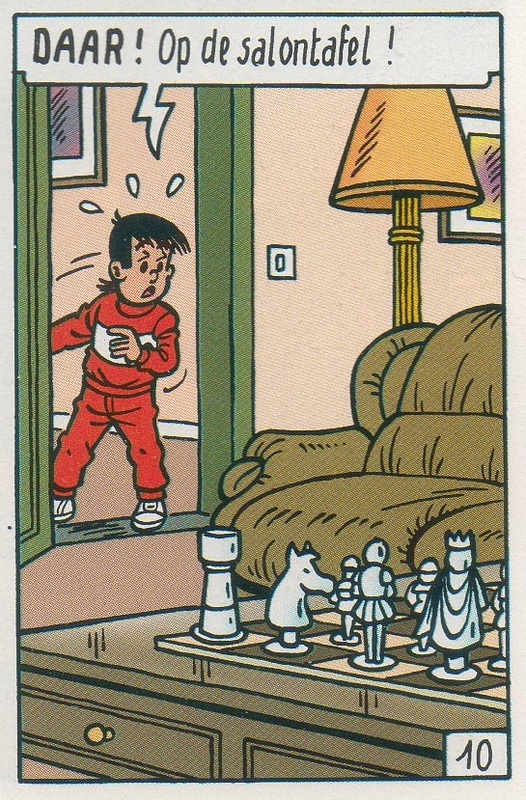 The family decides to investigate and heads to Vital’s house, where they find his chessboard as per the image above. Konstantinopel:2 There! On the coffee table! Yeah, I get it. I myself am completely jaded by now, but the first time seeing a1 as a white square is a rather disturbing experience. I cannot discern a pawn on a2, but it might just be completely obscured by the b1 knight. 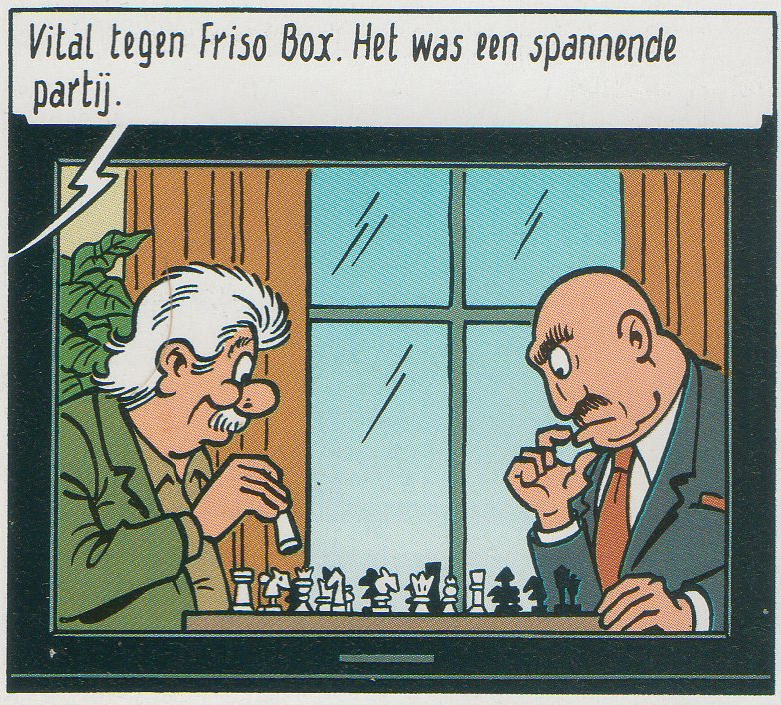 Frank Hubert: Vital against Friso Box.3 It was an exciting game. Yeah, I can see that as well. Unfortunately, the view of the board is not quite clear enough for a reconstruction, but it does seem odd how all white’s pieces are concentrated on the kingside. In fact, there seem to be so many pieces that I have difficulty believing that they fit on only eight ranks. Let’s count, shall we? There’s a rook in the corner. That’s good. In front of that, there is a knight. That’s slightly less convincing, but I could maybe, possibly, believe it. Before that there seems to another piece, and before that another one, and another one, and another one, and so on and so forth ad infinitum – or at least beyond eight. Plus, there seem to be three white knights? What?